Be sure to mark your calendars for the Arkansas Native Plant Society fall meeting to be held October 9-11 in Eureka Springs, Arkansas. Everybody is welcome to attend. Meeting registration is only $5 with no pre-registration required. Registration will begin at 5:00PM on Friday, October 9. The meeting site is the American Legion building located just north of Eureka Springs. From downtown, just travel north on Main Street (Highway 23) three miles past the train station. The American Legion is on the left just past the intersection of Highways 23 and 187. For complete and up-to-date details, go to www.anps.org or contact Mike Weatherford, President-Elect, at weatherfordm@sbcglobal.net or 870-820-8300. The meeting will feature the always-popular native plant auction, where you can bid on many Arkansas native plants not readily available at your local nursery. Be there at 7:00PM Friday and ready to bid! Several field trips to local areas of top botanical interest will be scheduled for Saturday and Sunday. We will offer something for everybody, whether you want to take it slow and easy or something more vigorous. You must sign up for field trips on Friday evening to allow for adequate logistical planning. 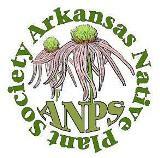 Saturday evening we will have a special program featuring presentations from several recipients of grants from ANPS made to individuals and groups for the purpose of enabling the study, promotion and establishment of native plants in Arkansas. Lodging in the Eureka Springs area is at a premium during the month of October. ANPS has reserved a block of 30 rooms in the Eureka Inn (Best Western), 101 East Van Buren Street (479-253-9551) at a rate of $107.95 plus tax. Please note that reservations must be made before August 20 to guarantee availability of this rate, and there is a two-night minimum stay. This entry was posted in Chapter Meetings and tagged chapter meeting, plant auction. Bookmark the permalink.